Dr. Klasko spoke at the dedication ceremony of the Sidney Kimmel Medical College Regional Campus at Atlantic Health System, based at Morristown Medical Center and Overlook Medical Center. Thomas Jefferson University and Atlantic Health System today formally dedicated the regional campus of Jefferson’s Sidney Kimmel Medical College (SKMC) at Morristown Medical Center and Overlook Medical Center, offering a program for third-year medical students unique in northern New Jersey. At a ceremony held today at Morristown Medical Center, members of the university and the health system gathered to mark the culmination of the academic alliance and celebrate the inaugural class of medical students as they begin the Longitudinal Integrated Clerkship (LIC), a special model of medical education that reinforces continuity of care and patient-centered treatment. The regional campus is among the recent strategic partnerships by Atlantic to strengthen its position as the premier provider of high-quality healthcare in New Jersey, as well as an important step in Jefferson’s growing presence in New Jersey, following strong growth throughout eastern Pennsylvania and South Jersey. 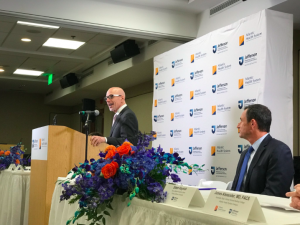 In 2015, Jefferson entered into an agreement with Atlantic Health System to establish the campus, the first site at which SKMC is establishing an LIC. The regional campus’s inaugural class of six students, all in their third year of training, recently completed inpatient rotations throughout Morristown and Overlook. They will now begin the innovative LIC curriculum, following selected patients through the full healthcare continuum of Atlantic Health System’s network of care–in many cases, from patients’ primary care doctors to specialists, both in the traditional hospital setting and with providers in community settings. Both organizations believe that the innovative LIC model for medical education and training reflects how medicine has become less reliant on care within the hospital walls. SKMC chose to pilot the LIC model at Atlantic Health System due to the organization’s robust continuum of care–a system comprised of more than 400 sites of care, including the network of more than 2,500 community-based healthcare providers in the Atlantic Alliance, and the high level of care offered at its six hospitals. For Aisha Golaub, one of the six LIC students, continuity was a big factor in choosing a third-year program. The Wayne, N.J., native noted that the inpatient rotations had already allowed her to witness patients’ progression through multiple stages of their care, an experience that is not traditionally found in medical education.